Two new pieces have been added to the Parkway series. The focus of this series is on striated colorways. Striation is a geological term for parallel lines or scratches occurring on the surface of rocks. Striation in art is parallel lines placed together. I am varying color combinations in striated fashion on each of these works. The series will reference the Blue Ridge Parkway to continue my interest in roadways and celebrate our local parkway. "Detour" breaks the rules slightly. There tends to be a general rule I've heard multiple times in art classes to never divide a work in half. I like the even placement of the light and dark grays in this piece. 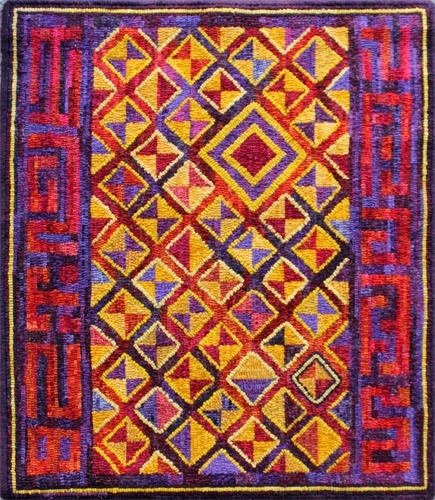 The brighter colors break it up while the lilac color placement and white lines allow one's eye to travel throughout the piece. There is nothing like driving along the parkway and suddenly seeing one of the detour or no entry signs on the road ahead, leaving you with one option: turn around and enjoy the view. "Triple Tunnel" developed from the three tunnels located one after the other on the parkway. This is near Ferrin Knob at mileposts 400.9, 401.3 and 401.5. We, as a family, have always loved tunnels. When the kids were young, we would all raise our hands, with the exception of the driver, and scream as we drove through. Great memories. The triple tunnel was and still is a favorite. The striated colors were placed horizontal. The metal "tunnels" provide contrast through both being placed vertically with a chain in the same direction. As one drives through the actual tunnels, the first two are fairly close together while the third is slightly further away. I placed the metal tubes to reflect this. It is interesting that when I first drew out this design it was to be a cityscape. It took a 180 degree turn and became a parkway piece. The blues and greens reflect the sky and grass seen along the drive while the reds and orange remind me of the beautiful sunsets on the parkway. I find that color becomes extremely important in geometric works. We have choices of neutrals, bolds, pastels, etc. to be used to define geometric areas of a work. Review some of your geometric works or view some on the internet, study color placement and have a great day. 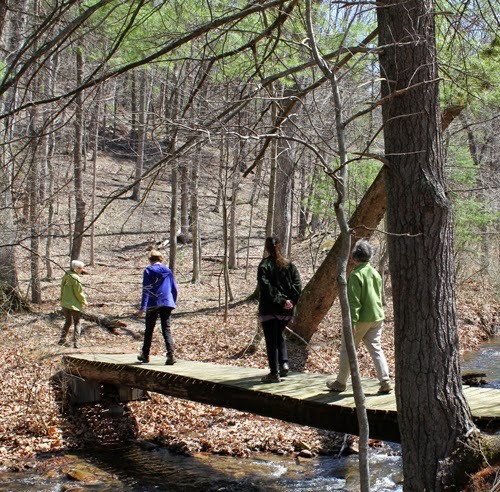 HOOKED RUGS AT "RETREAT INTO THE MOUNTAINS 2015"
Susan Feller leads the way during a woodland walk to a local waterfall at "Retreat in the Mountains 2015". A wonderful weekend of education, hooking, laughter and music was had by all. 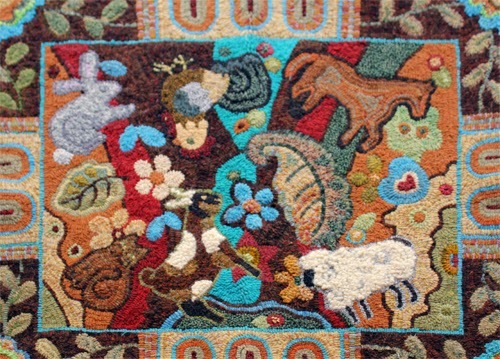 Here are some of the rugs seen during the Sunday "Throwdown", where we place rugs on the porch for all to see. 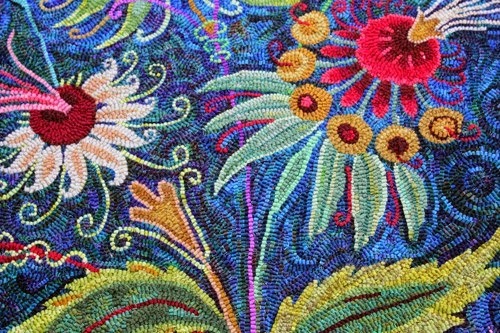 Partial shot of rug being worked on by Elaine Montambeau. The colors pop against the neutral blue-grays. 3-D flowers add to the beauty. 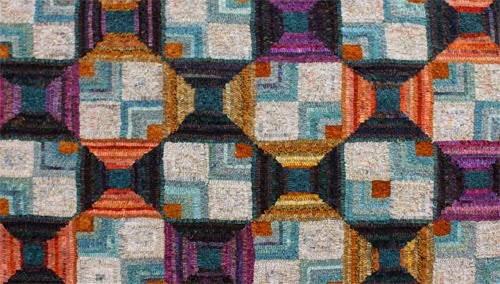 Close-up of Keri Sue Brunk's geometric. Note the variation of hooking in alternating circles that she incorporated. Colors are a dream. 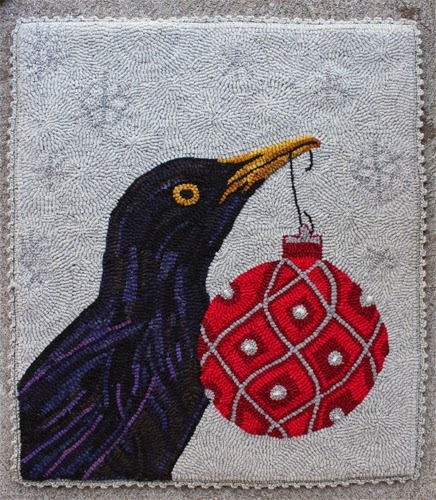 This rug hooked by Liz Gordon shows her love of folk art. Lots of neutrals in this with a wonderful pop of turquoise. 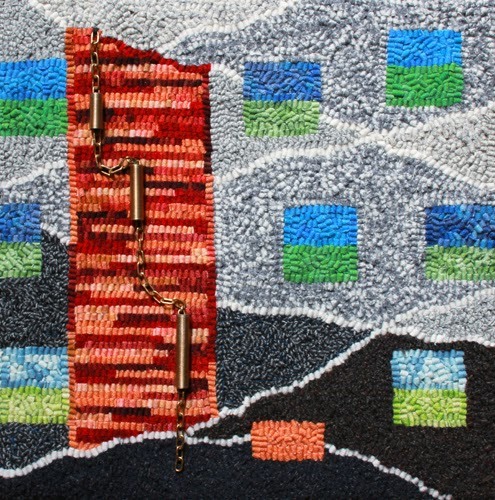 Beth Tembo was working on this piece last year and now we get to see the completed work. The contrasting geometric design on the sides compliments the piece nicely. Special thanks to Beth for helping me out with our weaving session. Never would have completed my little 4 x 4 square without her help. 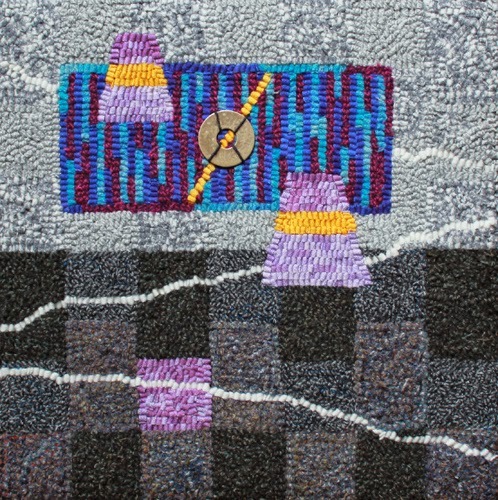 Deb Smith, editor of Rug Hooking Magazine, brought along this work to show. It has a beautiful crocheted edging she explained to us over the weekend. Note the sparseness of this piece with the subtle snowflakes in the background. 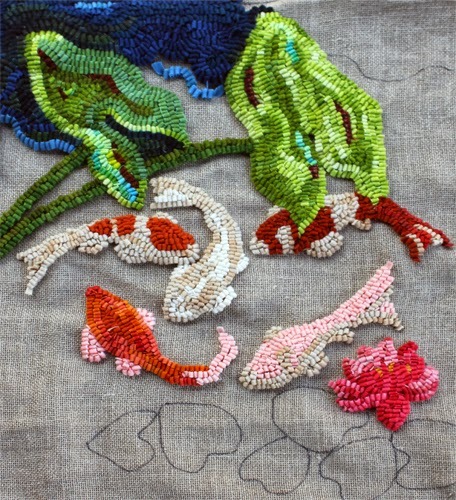 Karen Larsen was working on some Koi fish. This shot gives a good idea of how the blue background on the top will show up against the motifs in the rug. The blues will show off the fish beautifully. Geometric hooked by Nancy Parcels. The unexpected pop of bright yellow Nancy added brings life and a contemporary feel to this traditional design. Part of Susan Feller's year long study. 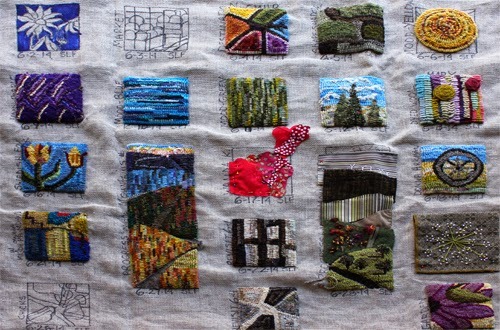 She has been experimenting with different fiber techniques and creating a square a day for 365 days. 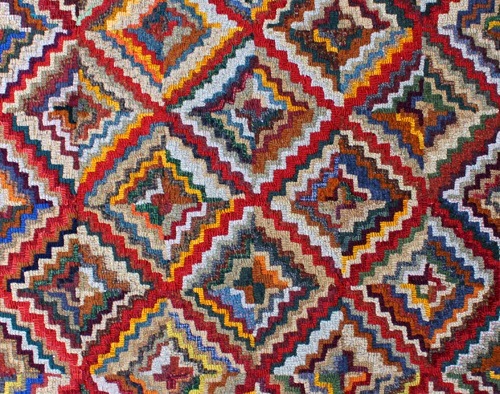 All twelve months will be on display at Sauder Village Rug Week this August. 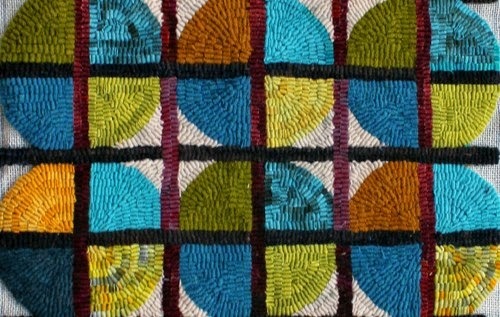 Tracy Granger's geometric hooking. Orange is my favorite color and it mixes great with the turquoise blues in this piece. Beautiful color changes while still keeping the piece balanced. Jen Pelton joined us this year and brought along her little chick. 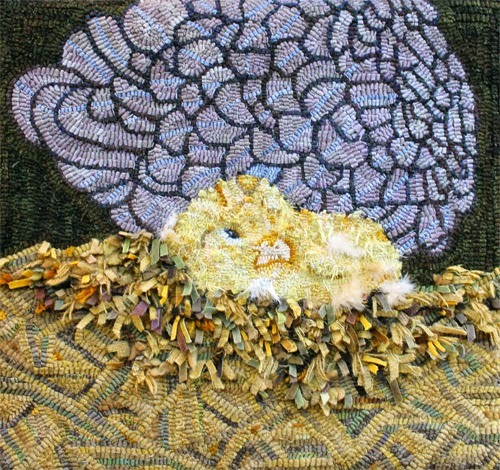 She added real chicken feathers in the chick itself, a shag effect with wool strips for the upper section of bedding and traditional hooking. Definitely a chick with attitude. 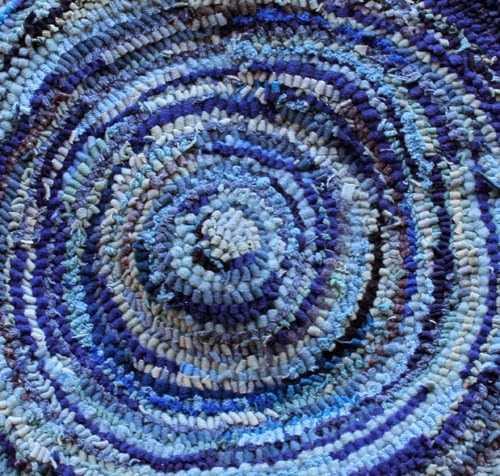 Shirley Hairston is creating a large spiral rug and the photo above is just the beginning. Looking forward to seeing this one completed. It takes careful choosing of colors and values to make such a large piece come together. I'm already looking forward to next year to see what members of this group will be working on, sharing, and creating throughout the year. Check out more information on the activities we participated in over the weekend by reading Susan Feller's blog here and have a great day. 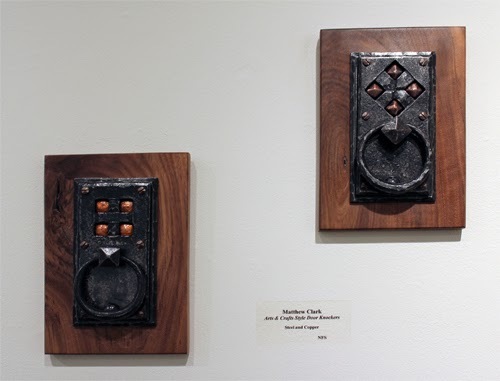 Pete and I took the time to visit the Toe River Arts Council Blacksmith Exhibit this week in Spruce Pine, NC. The exhibit runs from March 28-April 25. The council puts on some great shows and the displays are always well done. 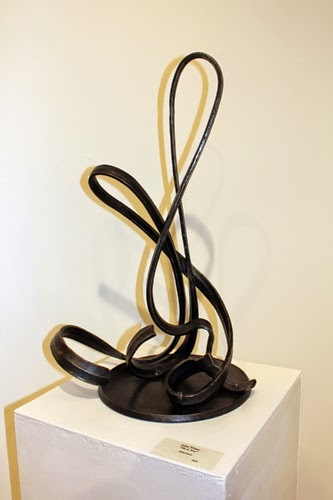 The exhibit is in conjunction with the annual "Fire on the Mountain" blacksmith festival to be held April 25 from 10-4 in downtown Spruce Pine. 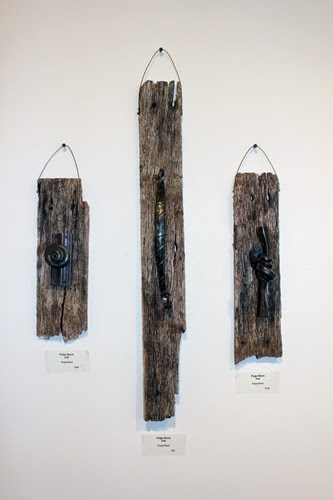 Here's a look at some of the works in the show. Website links when available. Everything about this piece says freedom to me. Makes me just want to fly away. A great conversation piece for any kitchen area. 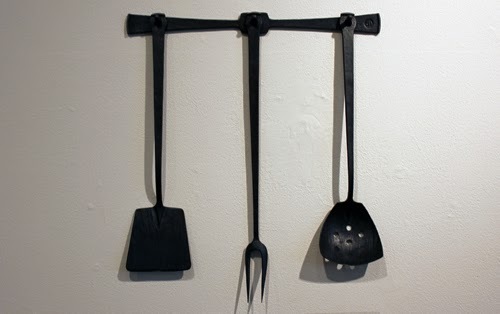 I really like the shape of the hanger and how the middle utensil hangs longer than the two sides. Art while I cook, yes! The rough look of the steel goes well with the display of these. I would definitely hang these on my wall as an art piece. This one really grabbed me. I saw this as the city in the background, the street light overhead in the front and a figure down below. The levels of each attracted me in their relation to each other. If I purchased this I would place it near my "City Crossing" wall piece. They would look great together. We have a timber frame home and these would definitely fit that style. 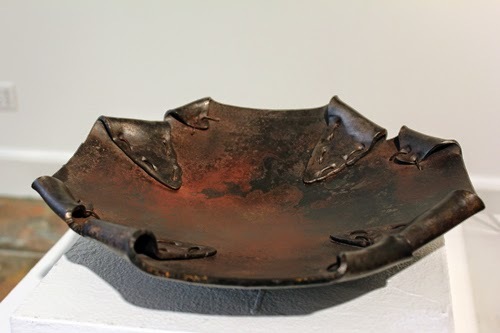 The mix of steel and copper add a lot of interest to these works. 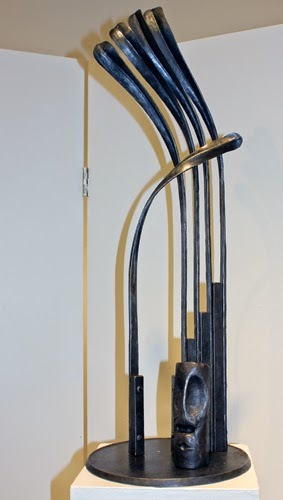 It is hard to tell in the photo, but this piece looks just like leather with stitching. 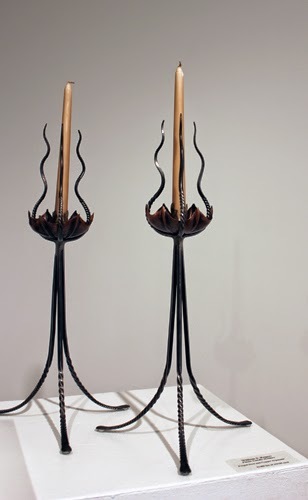 I kept going back to it to figure out how the artist achieved that look with steel. Lots of twists and turns. 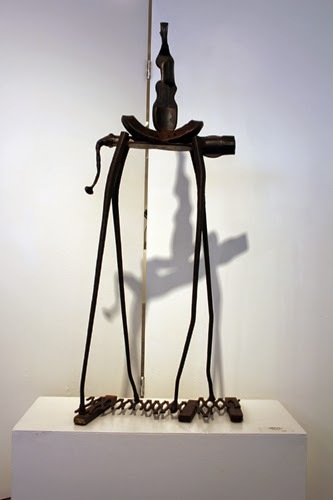 I could definitely relate to the title of the work and its sensuous feel. This railing would definitely attract attention from anyone using it. 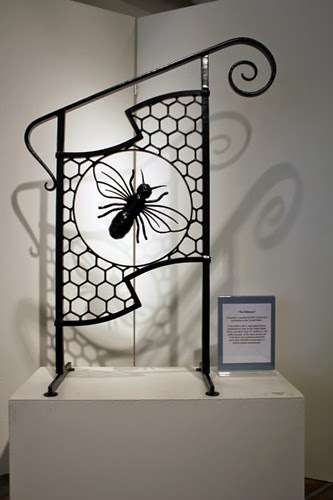 The honeycomb design around the bee and the way that section waves rather than following the straight angle of the rail is wonderful. I've always wanted a fire pit and these remind me of one's own personal fire pits in the house. They have an emotional feel for me. 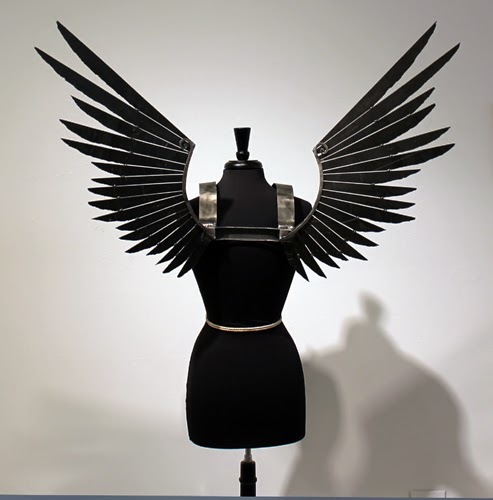 I liked everything about this piece. The elongation of the legs, the saddle, rider and horse done abstractly yet clearly identifiable. Definitely reminiscent of Dali's Don Quixote sketch, yet a piece unto its own. 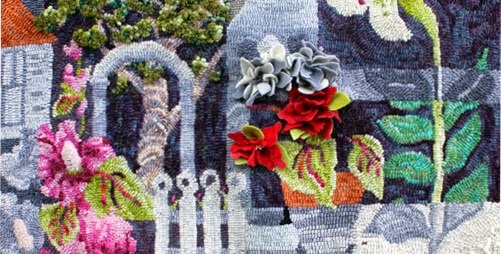 I find metal work fascinating and love seeing it combined with fiber art in a home setting. Think about the combinations you love and have a great day. No blog post next week as I will be on the road. Yes, I will be rug hooking!